Home » Is it just a pulled muscle? A Message for Pfizer. 20 Jul Is it just a pulled muscle? A Message for Pfizer. I was reading Oprah Magazine. I think Oprah is Bad A$$. She’s a powerhouse woman who changes lives. I’ll get off my Oprah high-box now. When I stumbled upon the ad above. Oprah, I love you, but you know better. You … bad people. ~ I thought to myself. I tend to be the passive type who doesn’t pick fights. Who would rather not give my opinion unless asked about it. Being peaceful, like the Dalai Lama – loving the canoodles out of everyone + everything. But this is behavior I can’t overlook. Pfizer, the makers of Advil + this ad, I’m not happy. You don’t just pull a hammy. You don’t just tear healthy tissue. 97% of achilles ruptures happens to tendons that had achilles tendinosis. This means 97 out of 100 people who rupture their achilles had tissue that was already pathologic + sick. Why wasn’t that sick tissue fixed + made healthy? Why did it have to end up in a rupture before addressing it? Because no one is talking about adhesion (A below) yet. The under the radar problem is adhesion. Adhesion builds over years of overuse. The overuse can be in the form of bench-pressing 3 days a week, sitting in a chair for more than 4 hours per day with lots of breaks, excessive reading or texting for your neck, too much typing at the computer, or your love of running or biking that isn’t counter-balanced with cross-training. 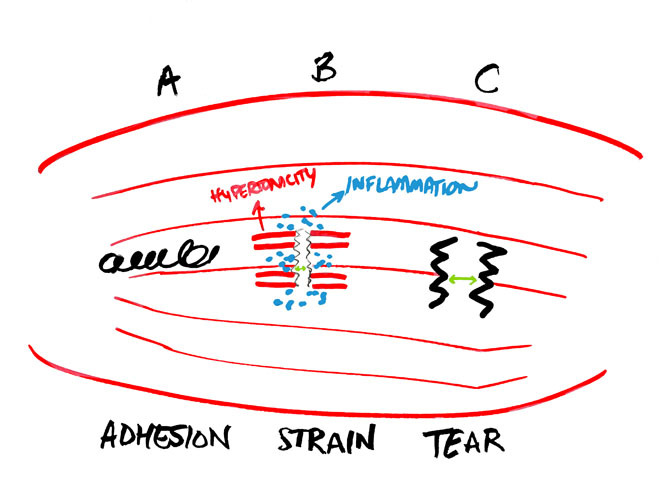 As you overuse tissue, you build adhesion over time. Building it, building it, wearing out surrounding tissue … and one day, something just pops on you (B above – in the image, a “strain” is used in place of a “pull” – they are the same thing). Pfizer – I get what you’re saying. And I understand there’s only so much you can do with marketing. You can make the pain from a pulled hammy less or go away completely. Long-term, the problem worsens as advil-consumers degenerate their knees or their low back faster because their hamstrings haven’t been at 100% capacity for decades. 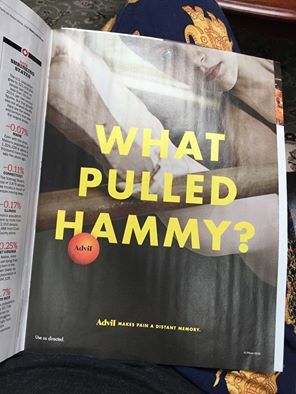 Advil-consumers didn’t know that their hamstring is their primary knee-stabilizer and that when not fully functional, their body is at risk for a plethora of almost any stubborn lower-body condition. Advil-consumers didn’t know that ITB Syndrome occurs because the Ilio-tibial band is attempting to stabilize the knee secondarily because the hamstrings have tapped out. But it’s OK, because the medical + orthopedic doctors tell everyone that degeneratation happens with age, so you, Pfizer, don’t think twice. For now, if you’re not Pfizer and you care about the health and integrity of your hamstrings, there are proactive things you can do to prevent pulled hammies. Test your risk of a pulled hammy with the touch your toes test. Test your risk of an achilles rupture with the knee to wall test. What is your experience with pulled hammies + medication? Did it work for your fitness + health goals, short-term? Long-term?